Mattress Mikes carries a variety of Futons made by Futon City! The Ontario frame is a very space efficient frame taking up no more space than its sleek arms require. The Concord frame combines stylist curved arms with versatility. The Corfu is so useful, combining a storage box under the arm-rest with abundant magazine storage below. The Corona frame combines stylist curved arms with versatility. The Eureka futon frame is a beautiful armless hardwood frame. The Imperial evokes Japanese temples and gardens; a bit of samurai as well. Plus it looks good too! The Redondo frame combines stylist curved arm with versatility. The Tray Arm is our classic tray-arm sweetheart and she’s been with us a long, long time. 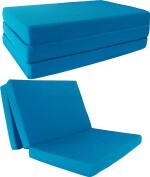 4" Tri-Fold Foam Mattress from Futon City. 6" Tri-Fold Foam Mattress from Futon City.